Click the designer's photo to read bio and get email info. 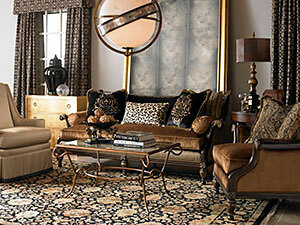 The Slater’s design staff is skilled in designing the perfect window treatment for your home. We offer a wide variety of soft and hard window treatments to suit your need. Anything from fabric hanging treatments, roman shades, blinds, woven grass shades or wood shutters. From the measuring to fabrication to installation, we are with you every step of the way. We have many fabric swatches to choose from to ensure you get the exact look you want! 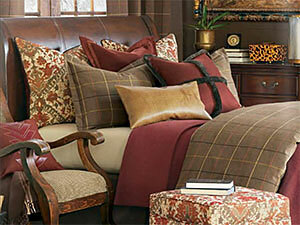 There is no room in your home that should make you feel as comfortable and special as your master bedroom. Nothing says “special” quite as much as your bedding. From duvets to coverlets to shams- we do it all! Let us help you choose the perfect combination of colors and patterns to create that one of kind bedding ensemble you’ve always dreamed of. 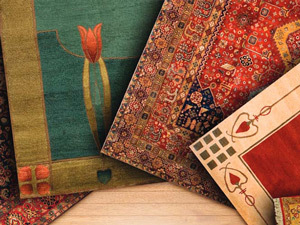 Come visit our new and exciting rug gallery featuring over five hundred samples and full sized rugs from fine handknotted orientals to sisals to handtuffted to indoor/outdoor. Need that special size or color? We also do custom. Don’t know what size or colors you need, don’t worry! We are here to assist! As with all our services we offer complementary in home consultations. Marilyn has been part of the local design community for over 25 years, both as a partner in and the sole owner of full service interior design firms. During that time she has worked on projects throughout California, making each client’s space uniquely their own. Always striving to give the best service possible and recognizing that Slater’s offers the most comprehensive selection in the Valley. She has recently joined the team of designers as an independent contractor. Marilyn holds a degree in Interior Design. She has furthered her commitment to design by qualifying as a member of the American Society of Interior Designers and a California Certified Interior Designer. She looks forward to working with you. "My philosophy has always been to make sure that the project reflects the client's personality and tastes, not mine." I always tell my clients, "If I leave your home and it looks like me, I have failed. Your home needs to look like you." Whether you're building your home from the ground up or dreaming of remodeling your existing home, Sharon has the experience and expertise to help you achieve it. Drawing her inspiration from your own unique style Sharon says "My philosophy has always been to make sure that the project reflects the client's personality and tastes, not mine." I always tell my clients, "If I leave your home and it looks like me, I have failed. Your home needs to look like you." In the furniture industry since 1982, Sharon has learned that a large part of the design process is intuitive and prides herself on building strong relationships with her clients. Home renovations both big and small can be an overwhelming experience. With the myriad of choices from furniture and fabrics, to area rugs, window coverings and paint colors; combined with mounting pressures of time and budget, the possibilities are at once restricted and endless. Every client has a different objective, so no job parallels another. Sharon can take the journey from something stressful to an exciting collaboration. "Sometimes people know they want a change, but have no idea how to achieve it." Sharon can identify your wants and needs, and transform your "house" into your "home." At Slater’s, we have resources that the general consumer does not. A client can search from town to town, store to store, or the Internet looking for a specific item, but never find it. As a designer, Sharon not only knows where to look, but has access to items from manufacturers that deal with tradespeople exclusively. This combined with Slater’s excellent customer service promises to make the experience seamless and pleasant, but actually fun. LOTS OF FUN!!! Art, fashion, and beauty have always played a significant portion in my life. Unfortunately,these areas of our lives often get pushed aside or are overlooked, but in reality these elements can play a significant roll in making our lives more enjoyable, meaningful, and stress free. It is my desire, therefore, to assist each client in finding and discovering their own personal expression of art, fashion, and beauty within their individual homes and living spaces (even if those areas of their homes and lives have been laying dormant for many years). Recently relocating to Modesto after 48 years in the Bay Area, my passion for interior design began as a child through influence in a small family design business. My stepping stones have included a 2 year interior design school, internships in fabric and furniture showrooms, a career path with the City Of Saratoga Building Department, a corporate relocation firm, a residential boutique design/build general contractor, window covering/shutter manufacturers and several Silicon Valley start ups where I supported all aspects of sales and team building. My intrigue in the “HOME” starts with the people and pets who live there! It is personally gratifying building rapport with each client to gain their trust and confidence first and foremost while collaborating about their interests. My goal is to gain insight of your goals, the functionality and use of each room you are desiring help with; whether being reinvented or just needing a new look. Additionally, as a mother of 4 children of my own, I understand active homes where space evolves, takes on constant repurposing and/or the need of special fabrics in these spaces for maximum protection against soils and everyday life! Whether you are strolling the showroom on a rainy day to “get ideas”, referred by a friend, neighbor or coworker or returning client starting a new home project, it is my promise and passion that you will have my attention to detail on every facet associated with your project.